It’s not enough to get a product to market, you need to get traction. How do you avoid the hidden pitfalls that cause high-risk ventures to fail so readily? Learn new processes and new skills to build a fully integrated product development process and team. Join guest Patrina Mack to find out how to address best practice research and practical approaches to apply classic market segmentation and competitive benchmarking to identify your unique value add, prioritize market opportunities and/or features, prioritize your product roadmap to balance costs/timelines with customer pain points, and course correct through major and minor upheavals caused by unplanned events. A recent global study of product teams found that there are five key factors that are common across high performance product teams. When these factors are effectively in place, product teams stand a 67% probability of achieving high performance. In their absence a miserable 2%! Join us on June 21st at 10:00AM Pacific for a cross-functional panel discussion with the study authors on each of these five factors from the perspective of product management, project management, and business analysis. Speakers include: Greg Geracie, president of Actuation Consulting and author of the global best seller Take Charge Product Management, Steven Starke, author of S.T.O.P The Project Management Survival Plan, and David Heidt, President of the IIBA Chicagoland Chapter. Most product managers think of Win/Loss analysis as something that sales people do. Something that only benefits the way vendors sell. But what can be learned about the portfolio, product, and feature set? This webinar will highlight three critical touchpoints — before, during, and after an implementation — and explore the insights we can use for make better product decisions. Join Steve Johnson of Primary Intelligence and Jon Gettinger of Accept Software for a discussion on improving your portfolio using “voice of the buyer” interviews. This will be a highly interactive session, so bring lots of questions! This session will three important topics in win/loss analysis. Open innovation is an incredibly powerful tool that companies can use to maintain market alignment with their products. However, these initiatives can be particularly difficult to incorporate into an organization’s pre-defined product planning process. Join us on April 19th for a detailed discussion on how your organization can use project and product management to achieve better market results with your products. Speakers Greg Geracie, president of Actuation Consulting and author of the global best seller Take Charge Product Management and Lee Lambert, CEO of the Lambert Consulting Group and PMI Fellow present. In the recent Study of Product Team Performance, 2012, respondents cited a "collaborative partnership between project and product management" as a key factor in creating value in the product development process. However, the relationship between these functions remains poorly defined in most companies and in industry literature. In the recent Study of Product Team Performance, 2012, 88% of organizations report that they could be more effective in bringing products to market on time, on scope, and on budget. Come join us on March 28th and learn how your organization can become more successful at delivering products to the market. Please join Greg Geracie, President of Actuation Consulting and author of the global best seller Take Charge Product Management as he examines the factors that improve or impede product team performance. Greg will share a range of findings from the 2012 study conducted by Actuation Consulting and Enterprise Agility based on responses from product managers, project managers, program managers, business analysts and other members of the core product development team. Mark your calendars and be sure to join us! When it comes to delivering successful products to market, there are as many ways to manage the planning process as there are product managers. Today phase-gate methodology seems to be the most popular. But "most popular" doesn't always make it the right choice to ensure that a product meets the needs of the market. Lean Product Management is a way to apply the right process at the planning level and make sure that your product meets market demands as quickly and as cost–effectively as possible. Join us and learn about the four product-market fit challenge types, how to identify the challenge type your project faces, and how to adjust your process accordingly. The talk covers key principles of Lean Product Management: dealing with uncertainty, achieving competitive separation, capturing market opportunity, and implications to the traditional project planning, phase gate, and budgeting cycle. If you are ready to challenge the wisdom of phase gate, this webinar is for you. Companies need to build successful products to grow and maintain their competitive advantage. Many organizations, however, lack the clearly defined product strategy required to create great products. Guest speaker Hector Del Castillo of AIPMM will discuss the benefits of adopting the Association of Product Marketing and Management (AIPMM) Product Management Framework (PMF) and the need for growing organizations to implement a formal product planning process based on the AIPMM Body of Knowledge (ProdBOK(R)). During the session on February 15, 2012, at 10:00 a.m. Pacific, you will learn to create value for your organization by aligning business and product strategy with unmet customer needs and market trends. In most companies, Product Management is responsible for building, maintaining, and presenting the product roadmap both internally and externally. The goal is to tell a compelling and comprehensive story as well as to capture and access the right data and insights to make objective, informed decisions. join us to discuss the strategic and technical roadmapping capabilities and expertise necessary to communicate product direction and strategy with the right level of detail to the right audience at the right time. The job of a product manager has become more challenging than ever before. There never seems to be enough time or resources to collect all of the necessary information and collaborate with key stakeholders in order to make mission critical decisions. We must find ways to build great products while working effectively with globally dispersed, cross-functional teams. Compounding the problem, almost every product manager enters the field from another profession and has to learn the job through trial and error. Join Greg Geracie, the author of global best seller Take Charge Product Management and president of Actuation Consulting, as he discusses these challenges and shares three key tips from his book along with the necessary context to apply these tips to everyday excellence in product management. In many organizations, there is a gap between executive-mandated product strategy and the day-to-day operational decisions that take place as the mandate cascades down. Simply put, there is a gap between what should be done and what does get done. As this strategic mandate cascades down the management chain, busy executives focused on their own priorities, try to minimize "change panic" or force fit into existing structures and processes rather than create new operational approaches. The result: abandoning a bold new strategic vision for something safe and completely ineffectual. Join Paul Williams of the American Institute for Innovation Excellence as he addresses the root causes for this innovation-execution disconnect and recommends processes, tools, techniques and management approaches to bridge this gap. Join Professor Chris Labash of Carnegie Mellon University to learn about the product innovation process and its impact on product strategy. Learn how innovation can play a key role in product development in any organization. Tom Grant, Senior Analyst, Forrester Research Inc. Dive into the reasons why organizations are overturning the way they craft and execute product strategy with special guest Tom Grant, Senior Analyst, Forrester Research Inc. Learn how organizations are reacting as a result of this change, and predictions into what this means for product development & the product innovation space. Product management is one of the few organizational functions that focus on long term strategic direction, while other functions typically focus on short-term, client to client, or quarterly results. This difference in perspective creates a tight linkage between strategic business goals that senior executives are focused on and what product management is chartered to deliver. Without an industry-wide agreed upon standard defining the product management roles and function, senior executives often end up determining the boundaries based on their past experience which shapes their expectations. This lack of industry-wide role clarity can often inhibit organizational success. The one common denominator is that senior executives expect the product management function to perform. Learn the importance of adopting a metrics-driven approach to enhance the relationship between senior executives and the product management organization throughout the product development lifecycle. Learn the latest techniques to successful product development collaboration. n this period of innovation - transformation happens at the speed of light and geographical and access barriers are fading; successful product development is driven by global collaboration. Companies must focus on managing product lifecycles while creating substantial advancement in introducing differentiated goods and services to fuel top-line growth. This is best accomplished through global collaboration of all areas in product development. Organizations struggle with the deployment and incorporation of innovation management – there is no consistent, well-defined framework for creating an innovation “discipline”. Join Paul R. Williams, Research Director at the American Institute for Innovation Excellence, as he shares his research on how best to implement a formal innovation management approach. Learn what these key “must-haves” are, and how this “Center of Excellence” approach will create a well-defined framework for innovation success. Successful innovation management extends past an enhanced "value chain" rooted in portfolio management concepts; it needs to also focus on strategic priorities balanced with execution discipline. In essence, the goal of any portfolio-based approach is to maximize the value of the overall portfolio and to balance the strategic fit, timing and sequencing, investment risk, operational capability and resource capacity. Based on recent research conducted by the American Institute for Innovation Excellence, what's missing is a way to resolve pain points (and main points of failure) experienced by organizations when seeking growth via an innovation management strategy. Prioritization is a major responsibility of product management, and we are given rough guidance to prioritize by business value. But assessing value is easier said than done given today’s rapidly changing conditions. Maximizing business value means focusing not just on obvious ROI, but deciding where to invest now for maximum value later and with minimum risk. How do we maximize value while reducing risks and managing costs? In this session, we will discuss “real world” strategies and practices for portfolio prioritization. Join us at 10:00 a.m. Pacific Time/1:00 p.m. Eastern Time with Greg Cohen, author of “Agile Excellence for Product Managers” and “42 Rules of Product Management” as he shares tried and proven methods for easily assessing value and balancing risk in the product portfolio planning and development process. Innovation today is very hard and complex. Multiple ideas from multiple stakeholders and multiple objectives requires multiple teams to execute in unison towards a common goal. The question is how to balance all this creativity with discipline? How can organizations shift from treating innovation as a one-time ‘invention’ event to an ongoing, real-time process that aligns execution dynamically with the ever changing corporate strategy? This type of strategic agility is no small feat and requires companies to undergo a fundamental change that drives dynamic decision making across the organization. Join us on June 1 for a special webinar as Carnegie Mellon University professor Chris Labash reveals how to make innovation doable, actionable, and sustainable. Learn why Next Generation Portfolio Management is the key to successful Product Innovation management in today’s complex economy. Make Innovation Work for You. Start the journey with Accept today. In today's hyper-competitive marketplace, a unified approach to portfolio management is critical for selecting the right product investments with the greatest commercial potential. However, there is a big difference between portfolio management theory and how it is typically practiced in leading corporations today. 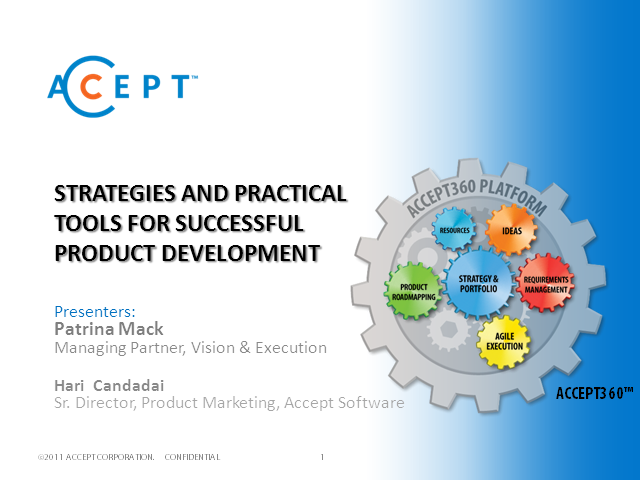 Join us as we discuss the findings from a joint study conducted by Accept Corporation & AIPMM as we share current portfolio challenges, practices and strategies of over 175 Product and Portfolio executives. Walk away with benchmarks, best practices and recommendations on how to make Innovation Portfolio Planning your key competitive weapon. A uniquely collaborative approach to product planning that makes life easier for product professionals while transforming product outcomes.